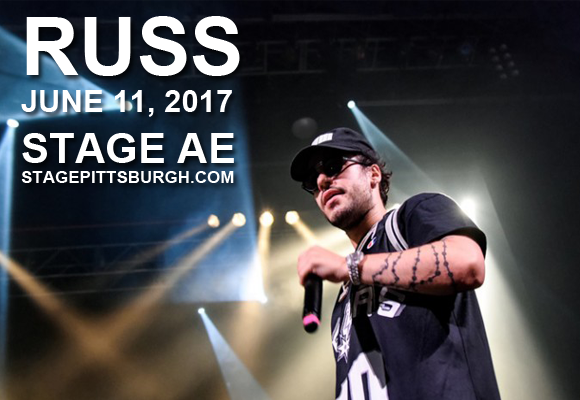 One of the hardest working new faces in hiphop, Russ, will be tearing up the Stage AE stage on Sunday 11th June 2017 on The Wake Up Tour! The "What They Want" rapper and DIEMON crew member will be bringing his raw, hard-hitting tunes for the dopest show of the year – don't miss it! Hailing from Alpharetta, Georgia, Russ is a rapper, singer, songwriter and record producer. At the age of 24, Russ has already been making hiphop beats for a decade, with 11 albums and 87 tracks under his belt. Having formed the DIEMON collective with two friends and fellow hiphop artists, Russ began producing mixtapes prolifically, releasing eight from 2011-2014 alone. The tapes brought him to the attention of Capitol Records, and he signed to them in 2016. Russ' biggest singles so far, "What They Want" and "Losin Control", peaked respectively at number 83 and 77 on the US Billboard Hot 100.